Taylor Leier Makes Another Impression in Shootout Win · Let's Go Amerks! There’s often games where the team says one thing the morning of or day before a game and then the opposite happens. That wasn’t the case on Friday night when the Rochester Americans kept their feet on the gas pedal and it paid off in a shootout win over the Utica Comets. CJ Smith had talked before the game about next guy up mentality in the sense that without their top goalie and top defensemen it’d be up to the next guy to step up. Matt Tennyson, Taylor Leier, and Jonas Johansson were those next guys up. Taylor Leier joined the Amerks after the Buffalo Sabres acquired him in a trade for Justin Bailey. A week later he’s the talk of the town leading the team to a shootout win. Wednesday night he scored his first goal with the team to give the Amerks a 3-0 lead (they ended up winning 7-5) and followed it up Friday night with the shootout wining goal over the Utica Comets. Leier thought he was going to have to fight Tanner Kero after the incident but he said Kero didn’t want to go. Two minutes for charging, the team killed off the penalty, and Leier apologized to the bench afterwards. It’s doubtful anyone felt an apology was necessary. Utica was controlling the pace of play through the first period and into the second period but it didn’t phase Jonas Johansson at all, he actually enjoyed it. Reid Boucher scored his 18th goal of the season at 4:36 of the second period with a quick wrist shot from below the hash marks. The Comets were pressuring in the offensive zone as they had the Amerks chasing pucks. Speaking of penalties or lack of, Scott Wilson took a fall after a leg appeared in his path of skating. No call. Make your own decision. The biggest and best hit of the game was delivered by Andrew MacWilliam. Carter Bancks immediately stepped up to challenge MacWilliam (even though it was a clean hit) and the two exchanged some punches. Taylor Leier was also mixed up with another Comets player which would have been a fight years ago but the automatic suspension for a second altercation eliminated the chances of that from happening. At the end of the second period the Amerks had a 31-25 advantage in shots, 20 of those were in the second period. During the second intermission Danny O’Regan talked about the message in the room and said it was to, “Keep playing the same way, keep shooting pucks, trying to hit them in the offensive zone, and eventually one of them was going to get through and capitalize.” That’s what happened at 9:34 when O’Regan tied the game at one with his lethal shot. Brandon Hickey sent a pass to O’Regan to score his 17th goal of the season and tie the game at one. He’s also scored seven goals in his last 11 games. Reid Boucher scored again to give the Comets a 2-1 lead at 11:14 of the third period. Jack Dougherty was attempting to block the shot but in doing so screened Johansson. A quick wrist shot later and Boucher tallied his 19th goal. Late in the third period the Amerks called a time out with 2:16 left to play and a minute later they tied the game. Toby Petersen drew up the play and sent out five forwards with one defenseman. Jonas Johansson was on the bench. The defenseman on the ice was Matt Tennyson and that’s who scored the game tying goal. CJ Smith took a shot that was blocked, it landed near Tennyson’s skates and he sent a quick low shot to the back of the net. As regulation ended it felt like the Amerks were lucky to get a point out of the game but by the time it was over it was an earned point by both teams. The Amerks dominated the three on three overtime with multiple chances and missed shots. Rasmus Asplund had the best opportunity but shot the puck wide. He immediately slammed his stick against the glass as he circled around to get back into the play. 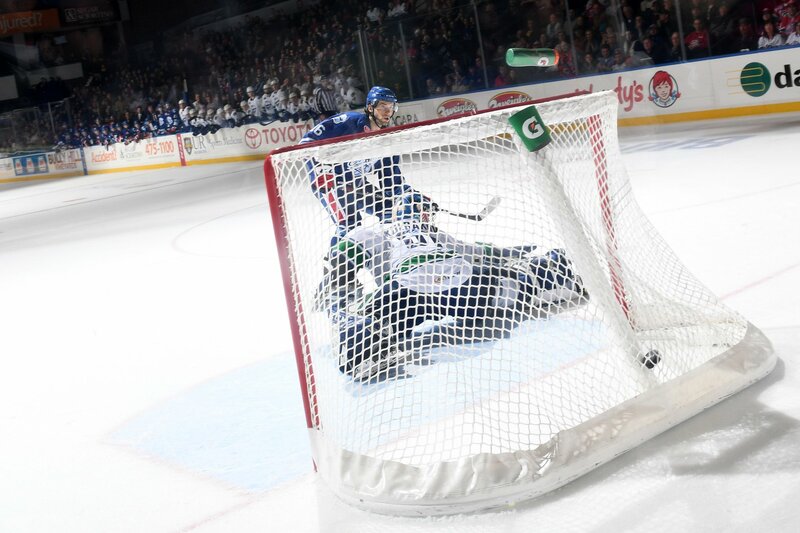 Jonathan Dahlen and Adam Gaudette scored on the first two shots of the shootout for the Comets but they were unsuccessful on the next five attempts in the seven rounds. Jonas Johansson finished the game with 35 saves and stopped five of seven shootout attempts. Danny O’Regan shot first and was stopped. Victor Olofsson and CJ Smith scored on the next two attempts. Wayne Simpson, Alex Nylander, and Kevin Porter were all stopped as well. Taylor Leier was the last Rochester skater to get an opportunity and it would be the game winner with a shot that sent the water bottle flying into the air. The old barn had a great crowd that was entertained by a winning hockey game. That’s how Friday nights should be.